The earlier photo of all the wolf tracks led to a good discussion about their relative size, and how to photograph them. I’d say Lynne Stone really showed how. Here’s her recent pic of wolf tracks in central Idaho with 60 pound mixed breed dog standing next to them. 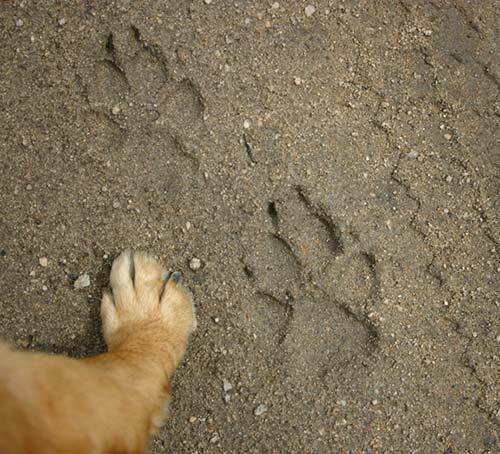 The photo shows the actual paw of a 60 lb mixed breed dog next to a wolf print. The dog’s paw is just over 3″ long. The wolf print is obviously nearly twice the size. The wolf was walking along a road made of decomposed granite (“grit”) that’s common in parts of central Idaho — and grit gives an accurate depiction of paw size. I did not consider the wolf track exceptionally large. This photo might help folks identify wolf tracks from a dog or coyote. If you see a track and it’s about the size of your hand, it likely might be wolf. Obviously wolf pup prints are smaller and a few domestic dog breeds do have very large feet. Now THAT is an awesome photo! I’ve got some photos pf my dog prints next to wolf prints, but I could not keep my dogs still enough to get their actual paws in the shot. Lynne is right about the size compared to your hand. Also note that the front paws are much larger the hind paws by about 2:1 or more, in my estimation. I haven’t noticed quite as much difference in size between front and rear paw prints in Mexican wolves as Matt indicates, but there is a noticeable difference. Also, as I pointed out below, our smaller (i.e. 55-85 pound) lobos leave smaller tracks than the wolves of Yellowstone. I love looking at tracks made in sand. It reminds me that even though we may think we are alone, we never truly are. WOW! I had no idea of the size difference between a Wolf’s Paws and a 60lb. Domesticated Dog. I have always known that Wolves are extremely large, but this really just puts it all into perspective. I saw an Eastern Timber Wolf once in a field in Upstate NY just watching me, then it turned and just trotted like it was out for a Sunday stroll. I have never seen another one since (I live far south of their typical range, and in a Metro area). I have two dogs, a Jack Russell Terrier, and a Husky/Akita mix. The mix looks, acts (shy and distrustful of non-family/pack members), and sounds just like a Wolf (She loves to Howl-Bark). She even goes as far as looking at the Moon and howling at it (Yeah I know, they say Wolves don’t actually howl at the Moon, but try telling that to her). When fully grown she will most likely be in the mid 60’s as far as weight. She has big paws, but I am not sure they will be as big as these Wolf Tracks. If I ever want to find a Wolf Track on the other hand, all I need is my JRT. Actually, wolves aren’t nearly as large as some people think. I saw a wonderful demonstration of how our imagination affects our perception of wolves: A captive wolf (via Mission Wolf) was brought into a high school auditorium and the students were asked to guess how much she weighed. The guesses, as I recall, ranged from 175 lbs to 800 lbs!! In fact the wolf, who was a small even for a female, weighed only about 65 lbs. Wolves are long of leg and have much bigger heads, muzzles, and paws than dogs; with a thick coat they look deceptively large. In actuality, they generally are about 15-20% larger than your average German Shepherd. Mech (1970) put an average female at 80-85, an average male at 95-100, though there is considerable variability. Stone notes that the wolf’s print is nearly twice the size of that of her dog. If an average male wolf weighs 95-100 pounds. how useful is it to compare the track with that of a 60 pound dog? It seems perfectly obvious to me why it’s useful. It’s to show how much larger the wolf track is than that of a medium sized dog. What did you think the purpose of the comparison was? Actually, if that is Lynne Stone’s dog, I think there’s an exaggeration about the size and weight of THAT dog. Having been stepped on and sat on by THAT very dog, I can honestly say that it is NOT a 60# dog. More like 40+ or somewhere in that ballpark, he’s kind of a Blue Heeler-like mix. His feet are kind of small with a tight toe pad configuration regardless of his actual weight. He is a very sweet and protective dog, but not really very big. I have seen wolf track compared to dogs of similar size as the body size of a medium sized wolf ~ like that of a subadult ~ they are larger and it is tough to scale but part of the size difference, I imagine, is due to specific body type of the animal. A wolf’s paws are configured to walk on snow making them wider and more spread out due to weight concentration in a small area. As Dr. Doug Smith put it, “…they have ‘snowshoe-like’ feet, thus the splayed out pad pattern.” Many domestic dogs have narrow, compact toe pads that are a “selected for” trait of their particular breeding. A more equalizing comparison would be if you took the footprint of a sled dog, with similar selected for traits~for moving over snow~and that of a wolf, of any size given you know what size both were would make for a better comparison.